If you didn't know, Patti has been in training for the past few months to compete in her first ever half marathon! And yesterday, she blew it away - especially since this was her first race ever. The butterflies should have cost an extra mile or two! This was a heck of an event - bands, bouncy houses, food / beer out the wazoo. Apparently, beer is not just for couches and football. Well, as I said above, she ROCKED it! That is awesome. 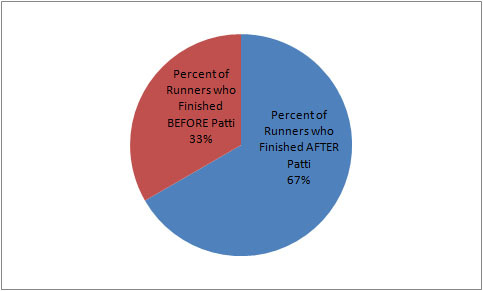 I am particularly proud of Patti for doing something I probably could never do (and definitely not as fast). Congrats hon!